Announcement GemSprouts™ is the original living plant jewelry company and was established in 2011. We have been featured in numerous newspapers, magazines, blogs, and websites and our products can be found nationwide in botanical gardens, State Forest Discovery Centers, boutiques, and gift shops. GemSprouts™ is the original living plant jewelry company and was established in 2011. We have been featured in numerous newspapers, magazines, blogs, and websites and our products can be found nationwide in botanical gardens, State Forest Discovery Centers, boutiques, and gift shops. The recipient loved the necklace. The little plant is very easy to take care of & is still going strong. I’d love to purchase more in the future! 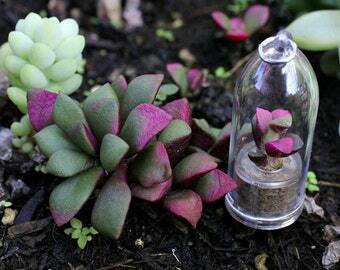 Check out our newest GemSprout plant, the "Little Gem" on sale for only $7.50 this weekend! Don't forget to stop in tomorrow for our Black Friday sale! We offer wholesale and wedding packages, please check out www.gemsprouts.com for more information. If any of your GemSprouts are received damaged or are lost during transit, please tell me first before leaving feedback, and we will have a replacement sent out as soon as possible. We attempt to describe and measure all of our items as accurately as possible, so please make sure to read descriptions carefully before ordering. While our GemSprouts come with a small cord, please do not hang them from your bags or on your keys - this can cause the plants to become dislodged, the containers to pop open, knock against other items and get scratched, or get stolen. We cannot replace or refund items that are lost, stolen, or damaged due to improper care or neglect. We accept Paypal, Etsy Gift Cards, and Credit Cards. To keep plants from having to spend the weekend at the post office, I normally do not ship on Fridays or Saturday. If your package does not arrive as scheduled, please contact your local post office first. All orders come with tracking, which can be found in your account. Also, keep in mind that many post offices will mark your package as "delivered" when it reaches your local branch, rather than when it's actually in your mailbox, and it will probably show up the next day. If it does not arrive, please contact us within a reasonable time frame. If you wait 4 - 6 weeks to let us know that a package has not arrived, we may not have any stock left. If you purchase a non-plant item outside of the US, you are responsible for all customs and import taxes. Please verify these with your postal system before purchase. We do not ship live plants outside of the US due to the phytosanitary permits and costs required. For bulk, wedding, and wholesale information or plant care, and other GemSprout news and updates, please check out our website www.gemsprouts.com. Please be advised that due to US Custom Laws we cannot ship GemSprouts outside of the US, Hawaii, or to military bases in foreign countries. All orders are shipped via USPS First Class in crush-proof cardboard boxes, unless you purchase the Priority 2 - 3 Day upgrade where orders will be sent in Flat-Rate small or medium sized boxes. Most of our orders are sent out within 48 hours, but during peak holiday seasons, some orders may not go out for 3 - 5 business days. If this is the case, we will adjust our shipping times accordingly in the Shipping & Policies Tab. Please make sure your plant is not left in the mailbox or outside for very long if you live in cold climates, and is unboxed as soon as possible. Most of our packing materials are recyclable, or have been donated by local companies. Please reuse if possible. GemSprouts are almost completely maintenance free. Like all plants they require earth, sun, and water. Each is planted in a special nutrient rich soil pad made of peat moss that promotes water absorption and strong stems. 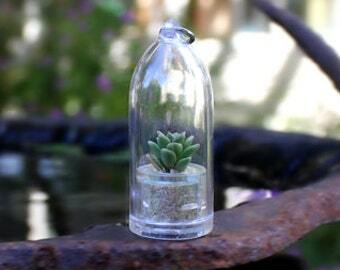 For dome containers, once a month simply place your GemSprout in a shallow dish of water for 2 - 3 minutes. Keep your tiny friend happy with an hour of sunlight each day (but don't hang them from your rear view mirror, leave them in the windowsill, or direct sunlight for very long) and like all plants, your GemSprout will continue to grow! For droplet containers, once a month either open the capsule and place a few drops of water around the base of the plant, or run the tip under the faucet (over the two small air holes), until a few drops get inside. Once you notice your plant is outgrowing the capsule, normally between 6 months and a year - simply replant your GemSprout in a larger container, or out in the garden. If you water them too much, they will outgrow their capsules in a matter of weeks, so please do not water them more than once a month, no matter how tempting it may be. All plants are watered prior to shipping and will not need to be watered again for 3 - 4 weeks after.